This chickpea and cavatelli soup recipe is an easy Italian pasta soup that makes for a satisfying supper tossed together from pantry staples. Cavatelli are small pasta shells that are traditionally made with an eggless semolina dough. Common in southern Italy, cavatelli are chewy in a spectacularly satisfying way and used in myriad ways, including ragu and bolognese and, as in this recipe, soup. You’ll find them either dried or fresh but frozen in some specialty stores. You can easily swap another small pasta shape for the cavatelli in this recipe. 1. Heat the oil in a 6-quart (6.8-liter) saucepan over medium heat. Toss in the celery, carrot, onion, and rosemary and cook until soft, 8 to 10 minutes. 2. Add the stock and half the chickpeas to the pan and bring to a boil over medium-high heat. Reduce the heat to low and simmer for 5 minutes. Use an immersion blender to purée everything in the saucepan until smooth or let the mixture cool for 10 minutes and then carefully transfer it to a blender and purée in batches until smooth. Return the blended mixture to the saucepan. 3. Bring the soup to a simmer over medium heat and add the remaining chickpeas and the pasta to the soup and cook until the pasta is al dente, 8 to 10 minutes. (The best way to check the pasta for doneness is to taste it.) If a thinner soup is desired, add more broth as needed. Season with salt and pepper. Divvy the soup among bowls and serve with a sprinkle of parsley and Parmigiano. You can cover and refrigerate any leftovers as the soup tastes terrific the next day, but will likely thicken as it sits in the fridge, so you may need to add more vegetable broth when rewarming it over low heat. Chickpea and Cavatelli Soup Recipe © 2015 Saveur. Photo © 2015 Weldon Owen. All rights reserved. All recipes and photos used with permission of the publisher. 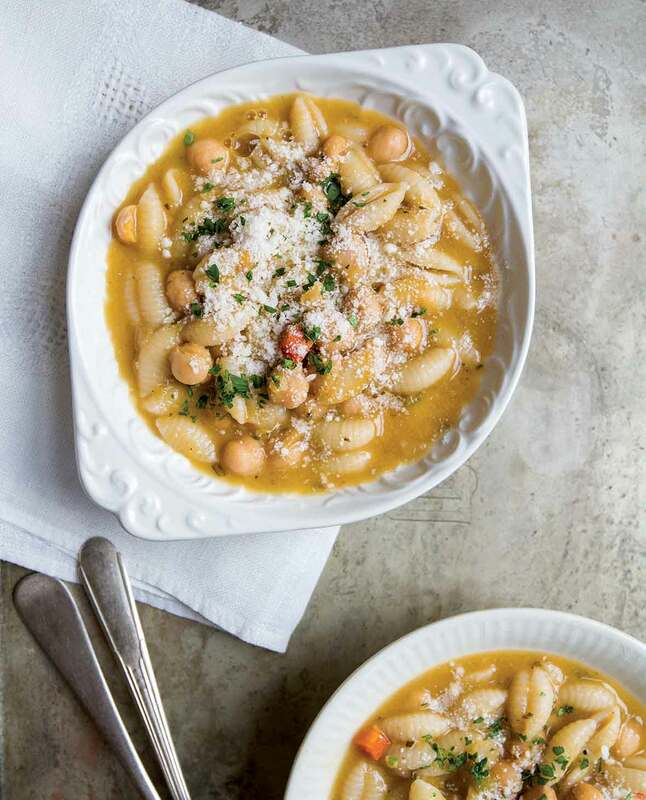 This chickpea and cavatelli soup is a wonderfully homey dish, halfway between pasta and soup. It is also a recipe that can be very flexible, depending on the amount of time you have. As written, it’s a super-quick, filling, flavorful and healthy vegetarian dish, a perfect pantry dish for a weeknight dinner—but you won’t feel like you’ve just thrown something onto the table. The pureed chickpeas and vegetables are rich and filling and the pasta, cooked in the soup, thickens it considerably. If you had some time on your hands and wanted to take it up a notch, you could use dried chickpeas that you cooked yourself and use the chickpea broth or homemade chicken stock (for a delicious non-vegetarian version) in place of the vegetable broth. You could also use water in a pinch, but I personally would then be inclined to smash a whole garlic clove and saute it along with the vegetables for maximum flavor. I used 4 cups Pacific Organic Vegetable broth, 1 cup liquid from the chickpeas, and 1 cup water. It’s 80°F with sunny skies and low humidity where I am and I can't believe what I just ate for lunch. I had a very large bowl of chickpea and cavatelli soup. I gotta admit that I really enjoyed it. I keep homemade chicken stock on hand at all times and used it but I think it would be equally good with a vegetarian broth. The recipe is straightforward and easy. It took 15 minutes of active time and 35 minutes total time. Always nice to cook things that require no additional grocery shopping as all of the ingredients could be on hand. I think this soup would be enhanced with the addition of a Parmesan rind during cooking to add another flavor profile. (I always keep rinds in the freezer for just this sort of thing.) An immersion blender makes easy work of puréeing this soup and I do like that some of the chickpeas are left whole to add texture to the end product. I used 1 sprig of rosemary and got 1 tablespoon chopped leaves. The rosemary didn't really shine through using one sprig—I think it’s an herb that needs to be added incrementally and tasted along the way so that it doesn't overwhelm the finished product. The soup tasted delicious and the pureed chickpeas gave it a wonderful mouthfeel. My sprig of rosemary was 2 teaspoons and it was enough and didn't overpower the soup. It was very good. I added 1/2 cup more stock to thin the soup. The only thing I might do the next time is use half fermented chickpeas and half regular—put the fermented in with the puree part and the regular chickpeas with the pasta. Good recipe. The family really liked this chickpea and cavatelli soup because it reminded them of stuffing and we all love stuffing. The taste is good but I thought it needed the cheese in order to have a little bite. It probably needs a splash of lemon juice to brighten. However, the base is good and for a soup, that's often the most important thing. I could see adding spinach or other things. I didn’t add the last of the chickpeas when I added the soup and pasta. Instead I waited until the last 2 minutes of cooking and then added the chickpeas. By the end of the meal, the pasta had absorbed more broth so when reheating leftovers, I’ll add more broth. At first glance, I thought this recipe seemed like it would be rather bland and like just another pasta and bean soup. I received a last-minute invitation to visit friends for the weekend so I packed up the ingredients to cook while I was there. I followed the directions without much variation from the recipe. It was delicious and it served 6 people with the last person scraping the bottom of the pan. I think puréeing the soup early in the cooking is what made the difference—it was creamy and the flavor of the rosemary wasn’t overpowering. It was a hit with adults and children alike. This is definitely a Testers Choice recipe. It only takes 45 minutes of hands-on time from start to finish. Once the pasta was added, it was perfectly cooked in 8 minutes (remember, the only way to know if your pasta is done correctly it to taste it since brands vary in the amount of time and it does make a difference in this recipe if you are using freshly made, fresh frozen, or dry pasta.) You can adjust the amount of rosemary to your taste. I started with 1 tablespoon chopped rosemary and then added about another half tablespoon for a total of 2 sprigs. We felt that the rosemary flavor was rather faint and the next time I will probably add 3 sprigs. This chickpea and cavatelli soup is a simple yet earthy soup that’s easily made on a weeknight or, if you want to use home-cooked chickpeas, a weekend meal with a little planning. This soup is hearty enough to be a single dish dinner or, in smaller servings, it would serve nicely as a beginning course. The rosemary is just subtly present and complements the pasta and chickpea nicely with the finishing touch of Parmesan. I did add the stock a little at a time so I could deglaze the pan a bit. Since I had prepared a batch of chickpeas from scratch the morning before, I used a mixture of chickpea liquor and vegetable stock for the liquid in this soup—2 cups chickpea liquor and 4 cups vegetable stock. As a main course for dinner, this soup served 4 (well, it served 2 people 2 days in a row). I thinned it with more stock on reheating. When making this again, I think I will actually make it with an extra cup of stock. I used Sardinians (Gnocchetti Sardi) Organic Spelt by Baia Pasta. This is a very satisfying combination of the chickpeas and pasta. This was my very first time using cavatelli and the soup was very easy to make. Cavatelli seems to be a dense pasta that adds a lot to the soup. Overall, the sweet onion flavor is what I tasted and enjoyed the most. 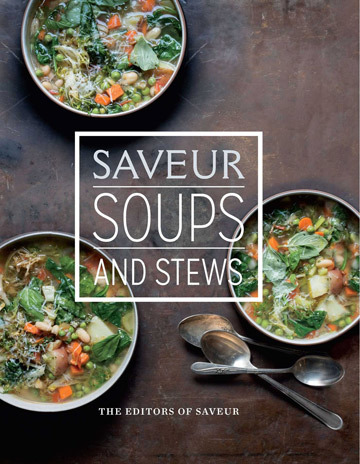 I've always loved vegetable soups and this one is different from others. We ate some roasted chicken and toasted bread on the side which made a wonderful meal. My grandparents came from Calabria and I grew up eating homemade cavatelli, a potato, egg and flour dumpling that I learned to make from my grandmother, which I later learned was referred to as “gnocchi” by most people. I’m curious why you refer to cavatelli as an eggless semolina dough pasta? Hello, Jennifer. Our research turned up the fact that it’s an eggless semolina dough. You can find Mario Batali talking about them here.